Meanwhile, back on the Civil War battlegrounds, soldiers were being hanged by the dozens for crimes such as guerrilla activity, espionage, treason, but most often for desertion. One such major spectacle was between the dates of February 5th and February 22nd, 1864, when 22 deserters were executed by hanging at Kinston, North Carolina. Legal hangings were performed with regular frequency, the most public of which was the execution of the conspirators who were found guilty of killing Abraham Lincoln in 1865, just days after the close of the long and bloody Civil War. Mortally wounded by John Wilkes Booth’s bullet, Booth escaped but was shot down 12 days later in his hiding place. 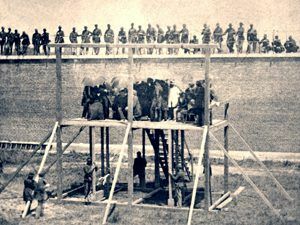 Execution of Mary Surratt, Lewis Powell, David Herold, and George Atzerodt on July 7, 1865, at Fort McNair in Washington City. Photo by Alexander Gardner. Mourning the loss of Lincoln, the government began a full-scale investigation, identifying eight members of a conspiracy team, including one woman by the name of Mary Surratt. Four of these conspirators were hanged before hundreds of spectators on July 7, 1865, in the courtyard of the Old Arsenal Penitentiary in Washington, D.C. Mary Surratt was the first woman ever legally executed by the federal government of the United States. These public spectacles of death for legal hangings and lynchings often took on a festival-type atmosphere, as families attended with picnic baskets in hand, vendors sold souvenirs, and photographers took multiple photographs of the event, many of which wound up on penny postcards. It wasn’t to be until many decades later that public executions in the U.S. ceased in 1936. From the ashes of the ruthless and costly Civil War, a violent stage was set for outlaws, vigilante justice, and mob violence that killed thousands of men, women, and children, most of them black. 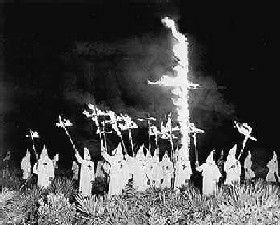 Upon the founding of the Ku Klux Klan in Tennessee, the lynching of African Americans grew to epidemic proportions. “Lynching” took on a whole new meaning as illegal hangings were soon attributed primarily to racist activities. From this time onward, mob violence was increasingly reflected in America’s contempt for racial, ethnic and cultural groups – especially those of the black population. But, it didn’t stop there, these racial prejudices also extended to Native Americans, Mexicans, Asian immigrants, and European newcomers. Youth was no bar to execution by these vicious people, as on February 7, 1868, a 13-year-old African-American girl named Susan was hanged in Henry County, Kentucky for murder. Susan, who was a babysitter, was accused of killing one of her charges. The newspapers helped to make these hanging more public by reporting items such as this one that appeared: “she writhed and twisted and jerked many times.” After her death, many of the purportedly “solid citizens” asked for a piece of her hanging rope for a souvenir. Lynchings during this time also targeted white men and women who were known to interfere with “Judge Lynch justice” against the blacks, those who had aided runaways, Union activists, and abolitionists. Lynching in the Wild West also increased after the Civil War as it experienced its most brazen period of extralegal hangings. Though most often focused as either a deterrent to crime or a resolution in political disputes, there were waves of indiscriminate terror waged against Mexicans, Chinese immigrants, and Native Americans. In many of the western territories, no legal authority existed, so the vigilantes took it upon themselves to dispense justice. In others, these Old West pioneers were simply too enraged or impatient to await the legal decisions. However, not all of the hangings in the Wild West were performed by vigilantes. 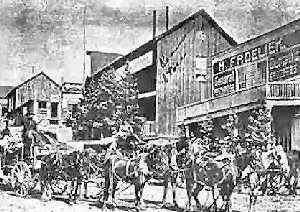 One such instance was the hanging of John Millan in Virginia City, Nevada on April 24, 1868. Millan was accused of killing a popular prostitute named Julia Bulette. Bulette who began her one-woman operation in 1861 was so popular among the locals that she rode in the Fourth of July Parade and was made an honorary member of the local fire department. On January 20, 1867, Julia was found strangled in her home with her jewels and furs missing. On the day of her funeral, every mine in the area shut down, and 16 carriages filled with the town’s leading men followed the hearse to the cemetery. Several weeks later, John Millan was arrested for her murder. While awaiting trial, Virginia City wives treated him like a hero, bringing him cakes and wine in jail. Found guilty, he was sentenced to hang. On April 24, 1868, crowds gathered from all over the state to watch Millan die on the gallows that were constructed one mile outside town. 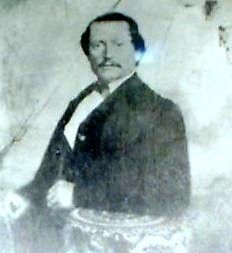 Back in the turbulent South, Wyatt Outlaw, a town commissioner in Graham, North Carolina, was lynched by the Ku Klux Klan on February 26, 1870. Outlaw, who was the president of the Alamance County Union League of America (an anti Ku Klux Klan group), helped to establish the Republican party in North Carolina and advocated establishing a school for African Americans. The Klan hanged him from an oak tree near the Alamance County Courthouse. Dozens of Klansmen were arrested for the murders of Outlaw and other African Americans in Alamance and Caswell Counties. Many of the arrested men confessed, but, despite protests by Governor William W. Holden, a federal judge in Salisbury ordered them released. Later the same year, on the raw frontier of the West, gunfighter Clay Allison sat brooding about a locally convicted murder by the name of Charles Kennedy. While drinking in an Elizabethtown, New Mexico saloon on October 7th, he soon stirred up sentiment against Kennedy. In no time, he led a lynch mob across the street to the jail, where they dragged Kennedy screaming from his cell. He was then taken to a local slaughterhouse where he was hanged and his body was mutilated with huge knives used for butchering cattle. Allison cut the body down, and using an ax, chopped Kennedy’s head off and jammed it onto a pole. Allison then rode his horse all the way to Cimarron, New Mexico where he put the head on display on the bar of Henry Lambert’s saloon. Later, someone stuck it on the corral fence at the St. James Hotel where it remained for months and eventually mummified. During this time, former slaves and free black men continued to be executed such as ten black men on October 19, 1870, in Clinton, South Carolina. In November four black men were lynched in Coosa County, Alabama; four were lynched in Noxubee County, Mississippi, and a federal revenue agent was hanged in White County, Georgia. Lynchings continued in earnest in the South and the Old West over the next couple of years. In 1873, Klansman laid siege to the small town of Colfax, Louisiana, which was defended by black veterans of the Union army. On Easter Sunday, April 13, armed with a small cannon, the whites overpowered the defenders and slaughtered 50 blacks and two whites after they had surrendered under a white flag. While hangings were taking place all over the South and the Wild West, one of the most famous was that of Jack “Broken Nose” McCall on March 1, 1877. Having gone to Deadwood, South Dakota in 1876, using the name of Bill Sutherland, he sat in on a poker game with Wild Bill Hickok. Losing all his money, Wild Bill generously gave him back enough to buy breakfast but advised him not to play again until he could cover his losses. Humiliated, McCall shot Hickok in the back of the head the very next day. He left Deadwood after killing Hickok, but was later arrested in Laramie, Wyoming, brought back to Yankton and put on trial for Hickok’s death. Found guilty, he was sentenced to hang. On March 1, 1877, he stood trembling on the scaffold, begging for someone to save him. He was buried in Yankton in an unmarked grave with the rope still around his neck. James Miller, a 23-year-old man described as a “mulatto,” was the first man to be sent to the gallows after Colorado achieved statehood in 1876. Miller, a former soldier, was convicted of shooting and killing a man who had earlier forced him, at gunpoint, to leave a dance hall reserved for whites. When Miller was hanged in West Las Animas on February 2, 1877, the trap door would at first not open. When it eventually fell, the trap door detached and came to rest on the ground. Miller dropped, but the hanging rope was too long, and Miller’s feet came to rest on the trap door below. The trap door was then removed so that Miller could swing freely. He then strangled for 25 minutes before expiring. The local sheriff, reportedly distraught over the botched execution, resigned and left town. I read the entirety of you piece, but not anywhere did I see a definition of “lynch.” To lynch is to punishment without the due process of law. Although most often the punishment is hanging, lynching is not synonymous with hanging, notwithstanding the articles connotes same.